SIP (Session Initiation Protocol) Trunking and PRI (Primary Rate Interface) circuits are both technologies used to connect a business phone system to the Public Switched Telephone Network (PSTN). This article provides an introduction to both of these methods, as well as covering core differences and outlining the benefits of each individual system. What are PRI and SIP Trunking? First, a quick re-cap on terminology. PRI’s have been used by large businesses for many years as a means of connecting their internal PBX (Private Branch eXchange) to the PSTN. In the USA, PRI’s consist of 24-circuit switched digital channels running at 1.544Mb/s, often referred to as a T-1 line. In Europe, this is referred to as an E-1 line and consists of 32 channels rather than 24, with a line rate of 2.048Mb/s. For a T-1 line one of the channels is used for control information only (and 2 channels for an E-1 line), meaning only 23 channels are available for voice traffic. Each of these 23 channels can carry one phone call at any one time. SIP Trunking on the other hand is packet based (meaning that the information or data is gathered in small blocks, or "packets"), rather than circuit switched, and transmits over the Internet rather than directly to the PSTN. It is a "virtual" connection over an existing physical data connection. Usually, packets are sent to a service provider who has the responsibility of routing those packets to their destination across the Internet and then finally to the PSTN. Unlike a T-1 line, the limit in terms of the number of calls that can be initiated is a function of the overall bandwidth available rather than the fixed number of channels. 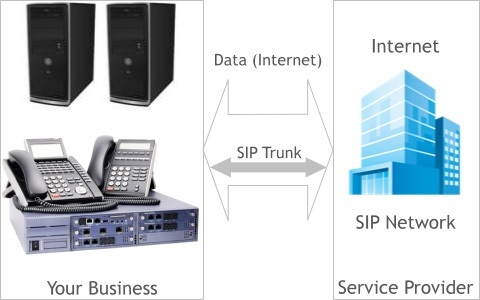 To summarize, SIP is a packet-based system geared completely towards communicating over the Internet and PRI’s are circuit switched and used primarily as a dedicated phone line to connect directly to the PSTN. Both methods can be used to connect most PBX and/or IP-PBX’s to the PSTN. Before the Internet became a major commodity, data (both voice and information) was required to traverse vast distances between nodes using primarily copper infrastructure that connected to interfaces like a T-1 at each endpoint. The modern-day IP-based PBX was non-existent and hence this was the best method to transfer information for many years. Figure 1 below illustrates a typical business phone and data connection to their service provider using a PRI. Unlike the modern Internet connection, the PRI is physically separated into different channels. Each channel is dedicated for a certain transmission across a network. Like a vehicle on a highway, it is bound to a single circuit (or lane) and is further subjected to certain speed limitations. At the core level, a PRI is essentially an endpoint for the raw transport of information. It has worked for decades and provides a high quality phone line connection. It does however have limitations in both cost and scalability. For more information on T1 see our guide to Business Internet. Compared to the underlying methods of transferring information with a PRI, a SIP transmission is like the modern roadway system compared to the ox-and-wagon method used centuries ago. The design takes full advantage of modern Internet architecture, allowing data packets to traverse networks with a multitude of different underlying protocols. A SIP transmission flows with other Internet traffic through a trunk, whether fiber, cable, satellite or something else. Most commonly, SIP uses UDP (User Datagram Protocol) or TCP (Transmission Control Protocol) protocols to traverse the Internet. These transmissions either connect to other SIP based devices or a SIP Trunking provider, allowing a call to connect to either the PSTN, cellular network, or other SIP/VOIP phone. Figure 2 below illustrates the SIP trunk "virtual" channel inside the data connection between the business and the service provider. With a modern IP-based PBX the SIP traffic managed by the system is sent to appropriate devices. SIP packets received by intermediary systems, such as SIP trunking providers, are routed to a regular telephone on the POTS (Plain Old Telephone System) or to another VoIP provider. Essentially, a standard SIP packet consists of roughly four pieces. The IP header contains information such as the type of service and info about where the packet comes from and where it is going. The TCP or UDP header provides source information, data pertaining to the payload and port info used for the transmission. The SIP header indicates payload type, number in the sequence and corresponding timestamp. The payload contains the actual information, arranged depending on the codec used for transmission as well as signaling (e.g. DTMF tones, when applicable). The article How to Digitize Voice for a VoIP Call provides further information on Internet protocols and packet formats for those that like more in-depth understanding. Since handling of origination and termination functions of SIP traffic is software based, the process is ultimately much cheaper. Companies providing the 'glue' have less expenditure which is passed on as savings to the customer. PRIs, because of the circuit switched nature, require physical terminations for each line and each timeslot channel. Generally, the process is expensive, as a physical mechanism is required to complete (or end) connections for data and voice transmissions. SIP trunks are essentially virtual connections, and as stated above the number of trunks is a function of the overall system’s bandwidth and for this reason, less hardware is typically required for any packet-based system. T-1 lines give you 23 available channels for voice communication. Note that this means you can have up to 23 simultaneous calls at any one instance of time. However, you do not necessarily need to have one channel per phone for your business. For example, you could have 30 employees, each with a phone, but only require 20 simultaneous calls. If you reach the point where you now need more than 23 simultaneous calls then you need to purchase another PRI line, and as such another 23 channels. This is a hard limit which can mean unconnected phone calls during peak busy times. Expansion needs to be considered before the actual need arises. Such scaling becomes expensive due to the increments of 23 channels and the installation of equipment. One note to make here is regarding fractional T-1 lines. This would allow you to scale in smaller increments with a PRI but in reality, the cost model for this rarely works out in your favor. SIP Trunks however are packet based so scalability is easy, providing you have enough bandwidth in your system. Typically, all that is required is to phone your SIP provider and request more virtual connections at a fixed cost per number of additional concurrent calls needed. Some providers include a “bursting” option, which allows you to go over your paid number of virtual connections for short periods. This can especially be useful when your business growth takes you closer to your current plan limitations. Some providers may also allow you control over the number of connections via an online portal giving flexibility to upgrade (or downgrade) as needed. The benefit of a circuit switched solution like a PRI is that there is a dedicated line to carry each phone call. If there are no phone calls the channels are simply unused. When a call is in progress it gets the full channel for the entirety of the phone call. Therefore, a PRI connection can provide a high Quality of Service (QoS). Most providers also include Service Level Agreements (SLAs) which guarantee reliability and ultimately uptime for your phone system. SIP Trunking is a packet based solution, which means your phone call is sent real time in small packets across the Internet. The down side of this method is that the data packet gets subjected to delay, packet loss, and jitter effects. These effects can be counteracted for data uses (such as web surfing, email, etc) with re-send mechanisms. However, real time communication protocols do not use re-send mechanisms, so any packets lost of "damaged" can cause voice quality issues. There are methods to improve QoS by assigning a higher priority to voice traffic over other data packets. Also, the quality of Internet connections has improved tremendously over recent years and many providers offer reliability and low latency guarantees. The actual hardware termination is more expensive with PRIs, as discussed above, where the cost of a T-1 line is usually significant. Prices usually amount to several hundred dollars per month and can vary substantially between providers and based on your location (a range from $300 to $600 per month is typical). Scaling in increments of 23 channels can make PRIs a costly proposition. SIP Trunks, on the other hand, are virtual channels where the only requirement is a reliable Internet connection with enough bandwidth for all your data needs plus an amount equal to your concurrent call needs. Note that this connection could actually be via a Data T-1 (or T-3) line though this is usually an expensive option these days and other alternative solutions are available to businesses. Prices can vary from provider to provider also. Two different payment options are typically offered, a fixed monthly rate for unlimited calls or a pay-as-you-go option where you pay for the minutes used at a rate based on the destination of the call. Fixed monthly rates can range from $15 to $30 per concurrent call (or user) required. Pay-as-you-go rates typically start at $0.01 per minute. SIP providers have highly competitive rates these days, often as low as $15 per trunk. The savings for a large business can land in the thousands per year (or even per month). Usually the larger business or enterprise will connect their internal PBX (usually an IP-PBX or a legacy PBX with a trunking gateway) to the Internet and the trunk provider will handle all traffic routing to the outside world. Internal calls configured inside the IP-PBX are mostly free between users since they are routed across the internal network. For smaller businesses (say 50 phone lines or less), the most cost effective option is usually a hosted PBX as all of the PBX functionality resides in the cloud and all a business requires for calling is an Internet connection and phones. It is a simple way to reduce your phone bills where no training and little maintenance is required. We always recommend doing your research and comparing different providers to get the best pricing. Use our free quote tool to get competitive pricing from SIP Trunking provider experts. You can also visit our SIP Trunking Providers page to compare options and to learn what questions to ask when getting quotes.